North Beach is a popular summer time spot for swimming for many Westport locals and visitors to the area. Surfing and fishing are popular all year round. The safest conditions are found in surf under 1 metre. There is a consistent north going rip associated with the rock wall to the south of the beach. There are no facilities located on the beach.The nearest facilities are 4 kms away in Westport. Access is via a road which travels up the rock wall. A metal road runs the length of the beach and there are a number of other access points from there. Buller Surf Rescue patrols this beach during the weekends of the summer months. A good beach for families with some facilities and is patrolled by Surf Lifeguards over summer months. It does have the potential to be dangerous in poor conditions so ensure your family is well prepared. North beach is one of the most popular beaches for swimming in the Westport area during the summer months. The beach has a gentle slope into the sea. Conditions are safest in surf under 1 metre. With increasing size, dangerous rips and holes develop. The exposed nature of the coastline means conditions are readily changeable and swimmers should be aware of this.There is rarely no waves and a consistent north going rip associated with the southern rock and swimmers should avoid this area. The region of the Orowhiti Rivermouth should also be avoided as it also has consistent rip currents associated with it. North Beach is patrolled during the summer months by volunteer guards of Buller Surf Rescue. There is no SurfLife Saving building on the beach. Rescue equipment is housed at the Westport Police Station. North Beach has a good left hand break off the rock wall of the Buller river at the southern end of the beach, but due to an inconsistent supply of good swell, it doesn't work well that often. In big seas it closes out, and in smaller seas, the swell is too small for the wave to break. This break is offshore in south to east wind conditions. There is also a beach break. There are normally 2 bars but more can develop in larger seas. The best tide to surf on is varies due to the bars. Surfcasting at the beach is quite popular at North Beach, as is fishing off the rock wall of the Buller river mouth. Offshore fishing is good, but fishermen and women need to be aware of the changing weather and sea patterns, as conditions can readily become dangerous. The beach is our favourite playground, but it can also be a dangerous place. Learn about the hazards at North Beach and be prepared so you and your family can enjoy the sun, sea and sand safely this summer. North Beach is a patrolled beach. The volunteer patrol service at this beach will commence in the summer season. More information about the 2018/2019 season (including start/end dates and times) will be available here once they are confirmed. 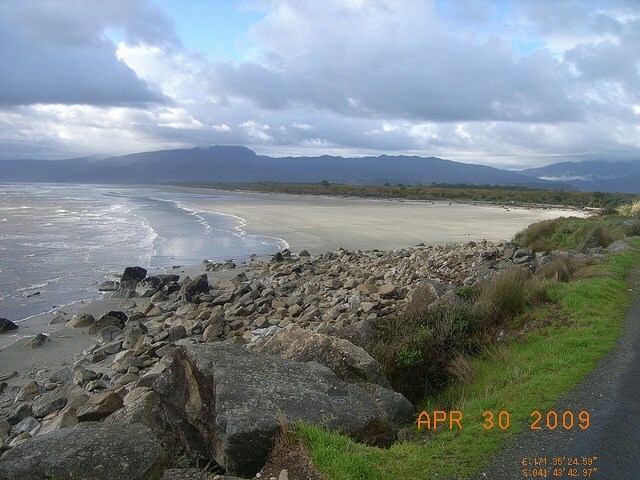 North Beach is a golden sand beach located 4 km northeast of Westport. The beach slopes gently into the ocean and is 1600 metres in length. There is a lot of beach at low tide. The beach is bound by the Buller river rock wall to the south and the Orowhiti Rivermouth to the north. This section of coastline is quite exposed, although Cape Foulwind does provide some protection from southerly swell. The beach is backed by a small number of residential homes and swampy areas. Access to the beach is via a road which runs up the rock wall. There is no designated parking area and no public facilities on the beach.